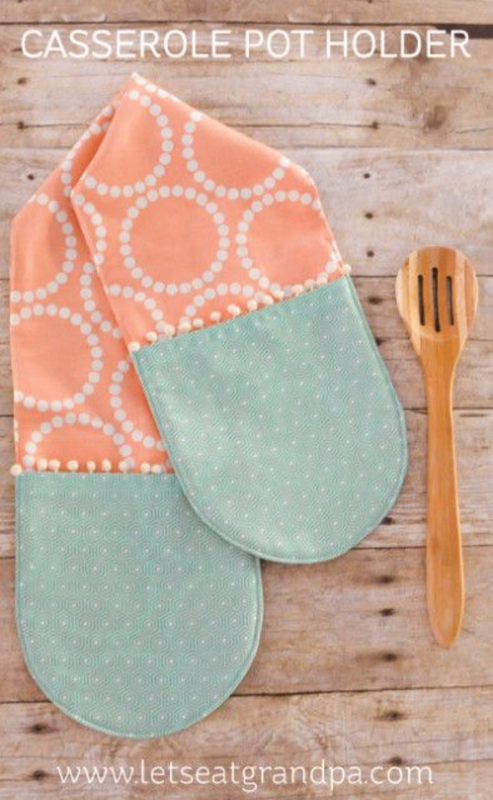 Every kitchen needs towels! 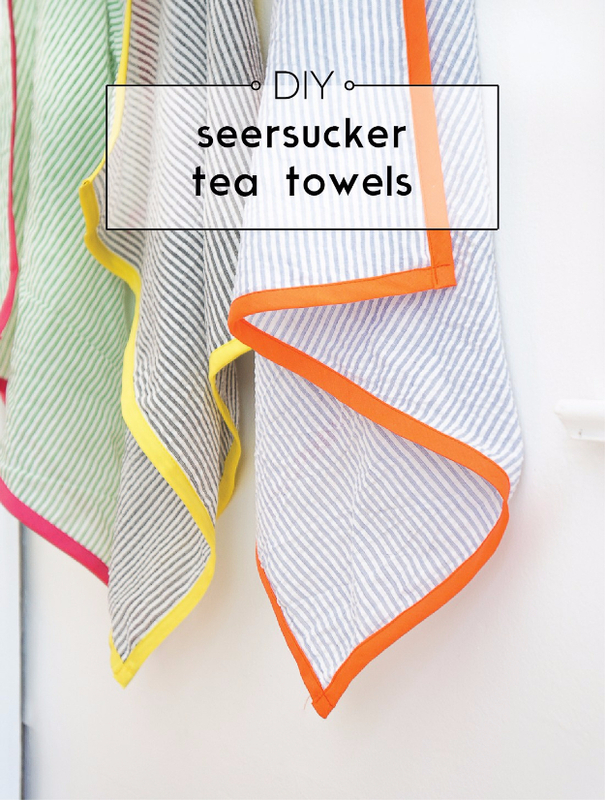 If it’s time to replace your well-used and dirty towels, here’s a very quite and easy pattern from Francois Et Moi. 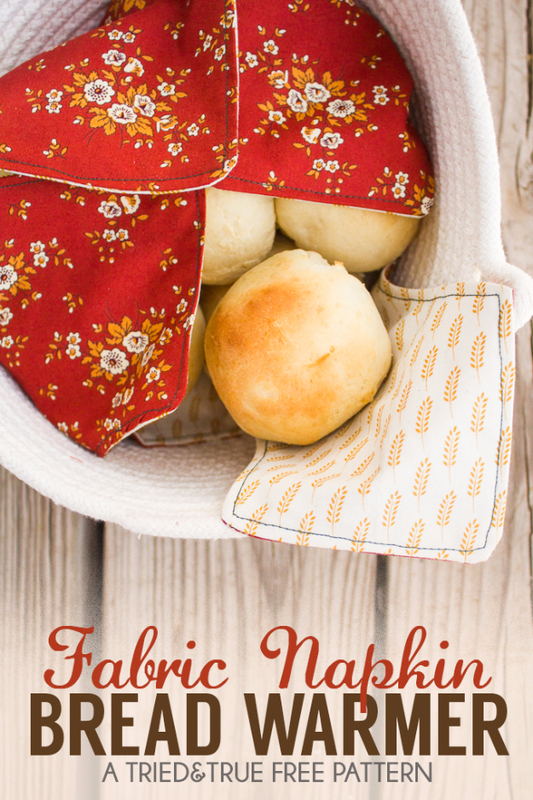 Don’t these napkin bread warmers just look so pretty and inviting?! These have been added to my DIY project list particularly for serving holiday meals. No one will be able to keep their hands out of the bread basket (although, that may have something to do with the fact that the rolls are delicious too!). Pattern. I always fall in love with the placemats you see in magazines from Pottery Barn and Restoration Hardware and others. This is especially true for the children table settings. It looks like so much fun to have Halloween, Thanksgiving, Christmas, and Easter table decor, but it’s never fun to spend that much money on something you don’t absolutely need. But this is why we like DIY projects! Particularly when they’re so simple!! 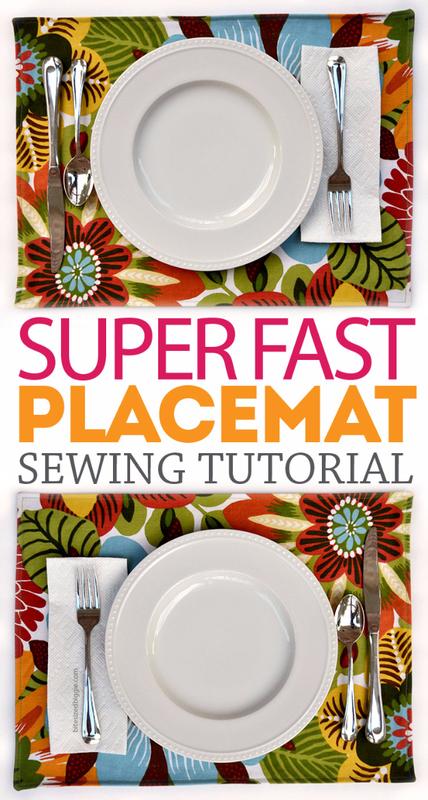 Bite Sized Biggie shares this “super fast” placemat pattern here. I really enjoy giving potholders as gifts. They’re more practical and long-term than food and treats and you can always stuff fun extra surprises inside the little pocket. I don’t like to give the exact same gift each year though, so I’m always on the lookout for good potholders patterns. This is a simple but great pattern from Radiant Home Studio. 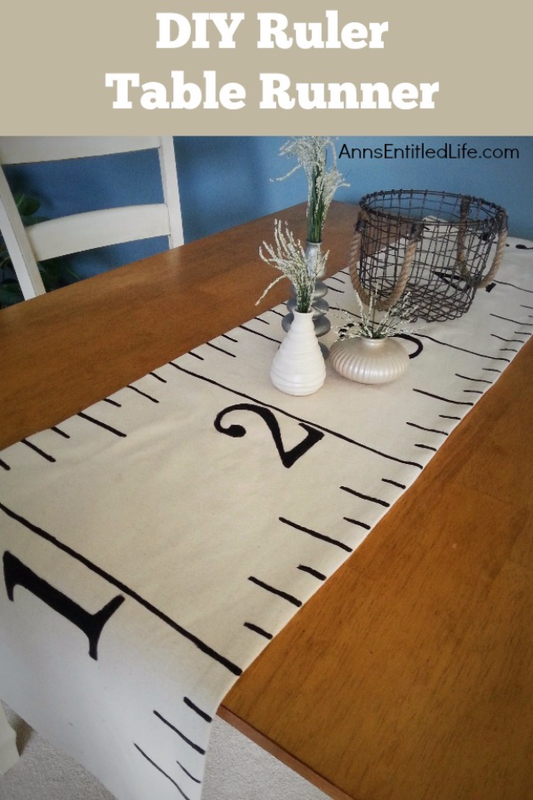 This ruler table runner initially caught my “teacher eye”, but it caught my other eye once I starting picturing it with other fabrics and designs. 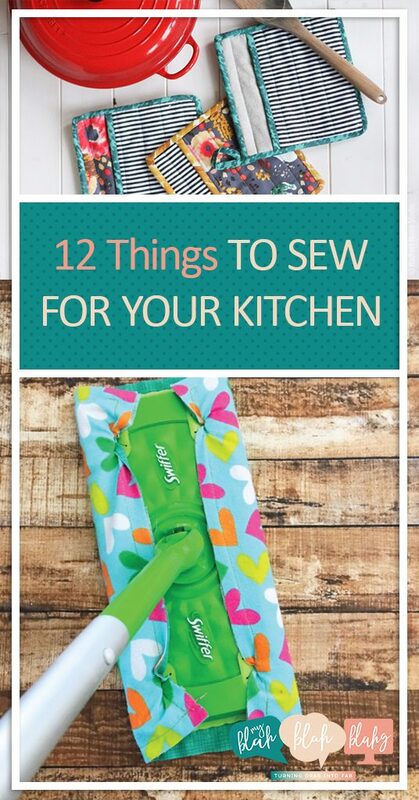 Table runners are such an easy way to add some personality to your kitchen! Not so much anymore, but I went through a phase of having cooking-show love. Chopped and I’ll Have What Phil’s Having were two of my favorites and then I discovered The Great British Bake Off on Netflix. I seriously want to adopt Mary Berry as my grandmother! If you haven’t seen the show you really should check it out! 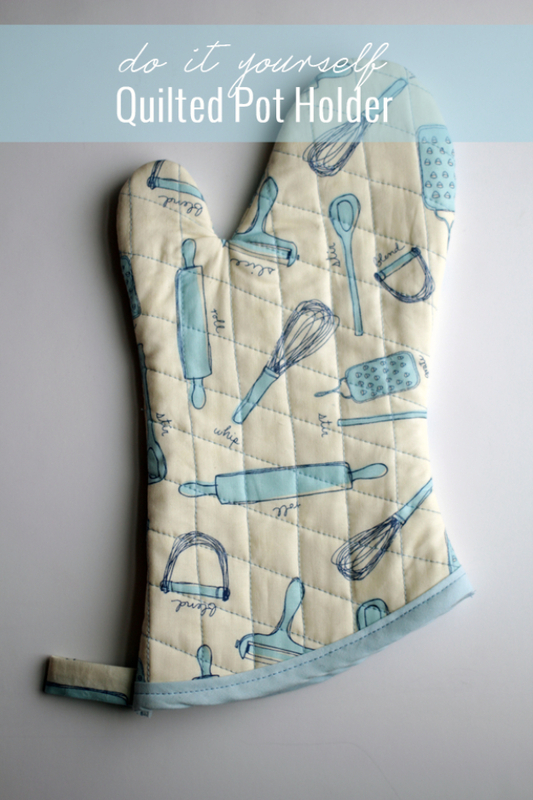 But on the show, Mary and the baking contestants use double oven mitts, which I had never seen before watching the show. They look so wonderful for bigger pots and pans. I’ve tried to find one at local stores, but apparently they aren’t so easy to find in The States. I could just order one online, but I like the idea of personalizing my own. I really like this pattern from Hey Let’s Make Stuff. 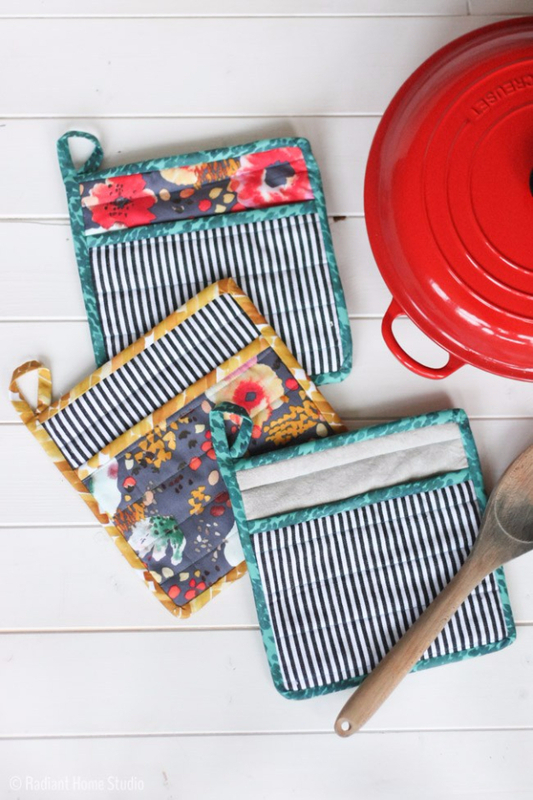 Whether for yourself or as a gift, pot holders and oven mitts are always in need. I LOVE the quilted stitching! Source. I’ve always liked the idea of the Swiffer, but I’m always a bit unsure of the effectiveness of the little rags. 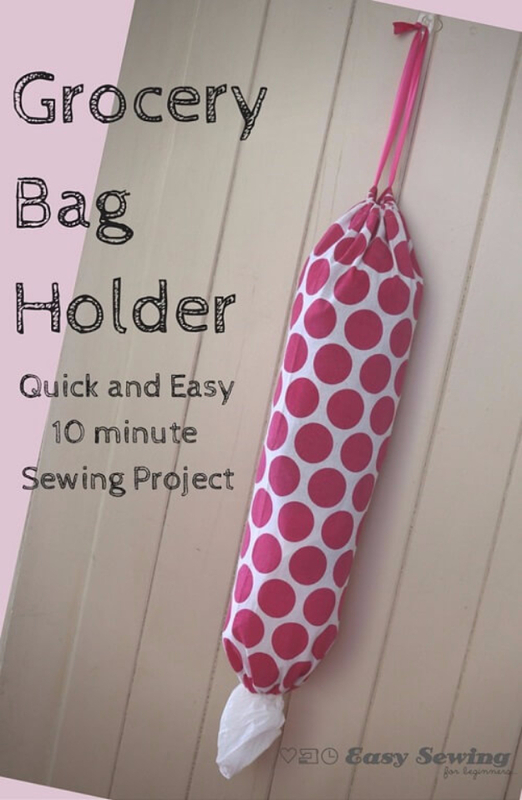 This was such a simple project that I made a few in just 30 minutes with some fabric scraps. The Swiffer and I are both much happier now (just not my boys who now keep getting asked to clean the kitchen floor). Tutorial here. 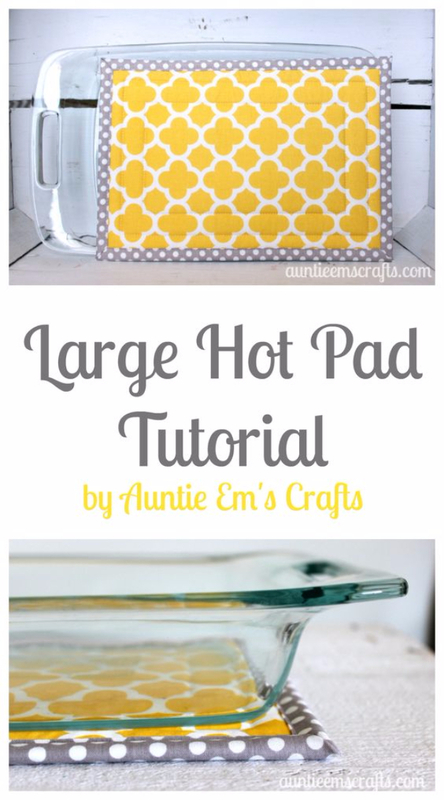 While smaller, square hot pads are common gifts and kitchen resources, I don’t often see large hot pads. I was gifted one five or so years ago and love pulling it out particularly for holiday gatherings. 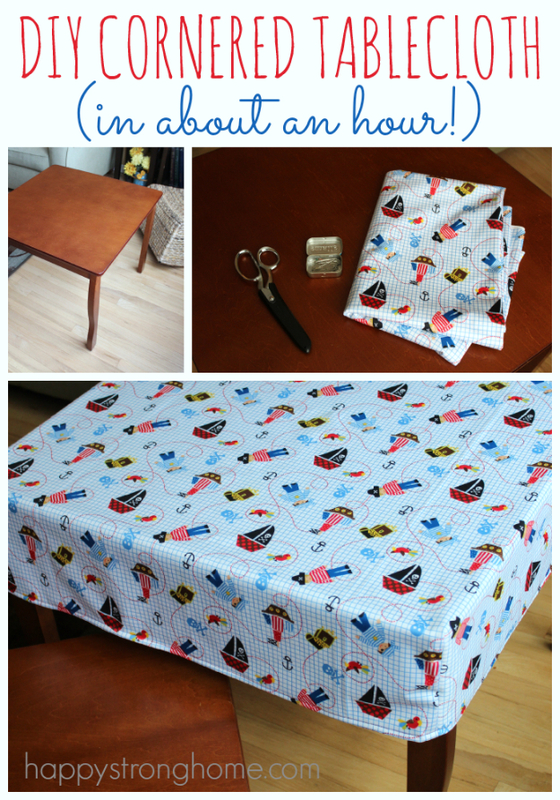 Auntie Ems Crafts shares the how-to here. I’ve been wanting to make an apron for a while now and have been looking for some inspiration. I think I’ve found my future project. Now if I can just find the time… But for when I do, here’s the tutorial for how to make this adorable apron. It might just be the teacher coming out in me, but I get excited when I see cloth grocery bag holders. Whether in my classroom or at home, I’m always sending one kid or another out the door with a project or something else in a plastic bag. And for these moments, I reach right into my grocery bag holder. I truly have one in both my classroom and my kitchen. 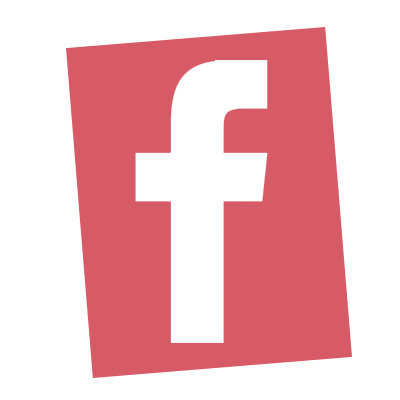 Find the directions on DIY Crush. Okay parents, raise your hand if your table takes a beating. Between meal time, school projects, and scouting projects, I’m pretty sure our poor kitchen table holds its breath every time my boys enter the room. I’ve tried covering it with table cloths and runners, but they either just look too formal or don’t stay on. I think I’ve found the perfect solution with this cornered tablecloth. I can take it off or keep it on whenever I want, but while my boys are at the table, I no longer have to worry about the wood getting damaged. Phew! 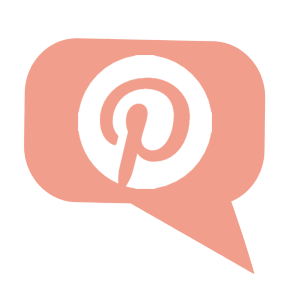 Find the DIY tutorial on Happy Strong Home.